Court of Fives is engaging and a fairly quick read. There was so much that needed to be explored that didn’t have the chance yet –hoping this will be resolved in Book #2. I would say this is more of a 3.5 star rating, rather than a whole 4. From what I’ve gathered via the author’s Twitter and in other reviews, this book is based off Little Women and the TV show, “American Ninja Warrior.” I can see elements of both in the novel. For instance, there are sisters who wait around and dote on their father, and one who likes to act like a boy (Jessamy, protagonist in Court of Fives; Jo, Little Women). There are four sisters. And that’s basically where the similarities end. Jessamy loves running the Court of Fives tournament and trains everyday behind her family’s back –though of course her sisters know. 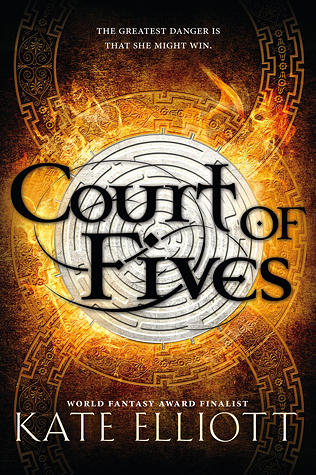 The Court of Fives is similar to “Ninja Warrior” if you’ve ever watched it, though its dissimilar because there are multiple people on the court at one time. There were parts of the book I thought were glossed over when they really needed more attention, like the giant metal spiders that are controlled by magic (yeah, what? )–and who can wield magic in this world, plus the actual tournament didn’t make a lot of sense. Maybe if there was a diagram of the court I would better understand. Also, the scenes where she runs the court of fives tournaments are really quick. One in the beginning and the second at the end. The book is titled after these games, but most of the book is training. I thought they happened more frequently. What drove me through this book was how Jessamy navigated the patriarchal society which she was born into. So many insults were thrown at her and I felt like I was slapped in the face with those words. Jessamy is a strong character. She knows what she wants, she does not hesitate, she’s strategic, calculating, and fiercely loyal. I would recommend this to fans of action, adventure, and fantasy. I would probably read the second book just to see if the points I touched on earlier are more fleshed out.